This Operation Smile stamp set has been one of my favorite sets for a year now, so tonight, the last night it was available I wanted to make just one more card with it. I was inspired by this card I found on Pinterest. I used my Memento Tuxedo Black to stamp the images. Then I colored everything in using my waterbrush and three inks: Canary, Glacier, and Pixie. I added a few scattered images from Doodled Designs and some pen dots in the background. I added a swipe of clear Wink of Stella to the balloons after the ink dried. 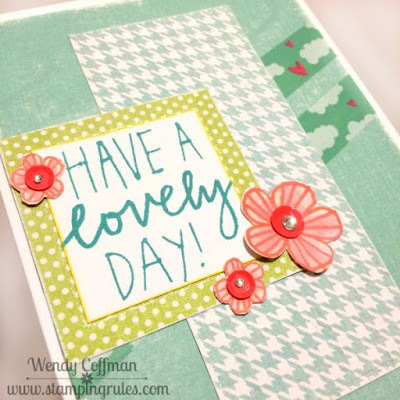 I also decided to stamp the sentiment onto some Blossom paper and trim out the FABULOUS. Tomorrow is the day we get to start posting art from the new Idea book, so that's fabulous indeed! Tonight I'm sharing a quick card I made to include with the Disney pics I'm shipping off to my family this week. We had such a good time in July - those are going to be fun to scrap! I used the Simple Stories Say Cheese II line and the new sketch from CASE this Sketch. 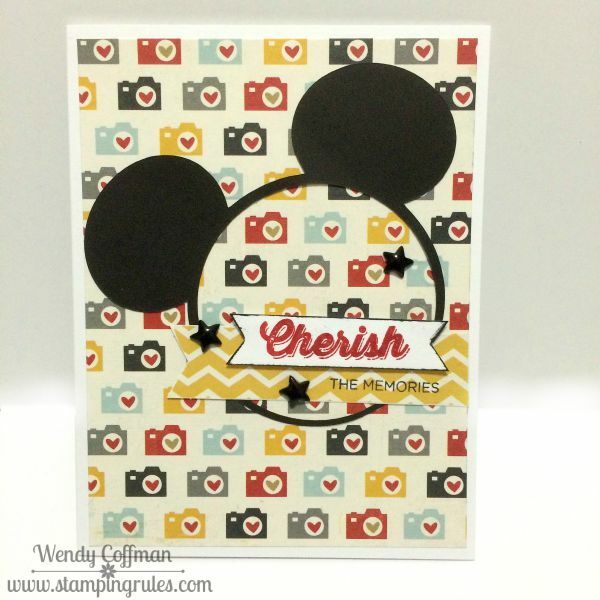 I kept this very clean and simple, with just the stamped sentiment using Finding the Words and one of the Mickey Head cricut cuts I made for convention. A few black epoxy stars finished off the card. Those stars came from the Scaredy Cat collection, which is one of the many fabulous products retiring in just one more day. Make sure you take a peek so you don't miss out! Tonight I did a bit of quick coloring with my Spectrum Noir alcohol markers. 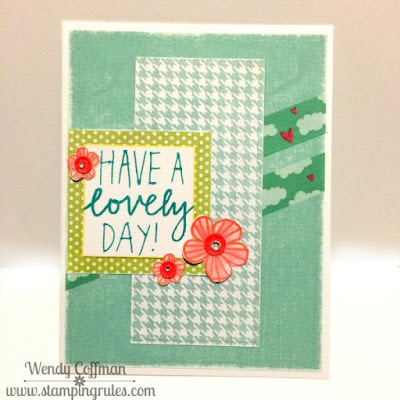 I have been looking at this Muse Card Club inspiration card all week. Finally tonight I remembered my Cute Koalas set and suddenly I was ready to make a card. I didn't want to paper piece the leaves so I loaded the black leaf image with green alcohol marker ink, then blended it out in a halo of color around the leaves. I loved how that effect came out - if you try it out, leave me a comment so I can come see your work! I had the rest of the Babycakes Picture My Life card I used on my layout from last night sitting on my desk. I flipped it over and this cute lady bug was sitting there just asking to be on a card. So I trimmed her carefully out of the card and popped her up on some thin 3-D Foam tape. I trimmed some panels from my Zoe scraps to work with the the new sketch from Freshly Made Sketches. I stamped the circle from Doodled Designs onto white cardstock and trimmed that out too. The Hello sentiment is from Rain or Shine. I colored in the FRIEND word with gold Wink of Stella. I added some gold to the dots of the ladybug to finish off my project. 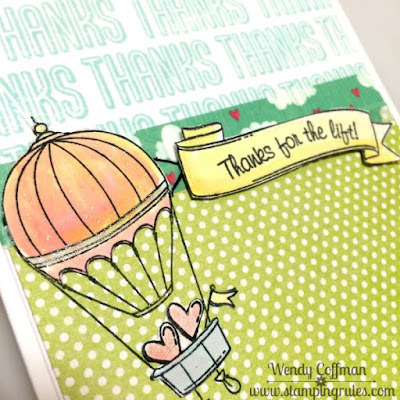 Thanks for stoppin' by, Stampin' Friends! Tonight I was itching to scrap something instead of making a card. The boys had a busy day, which lead to a tough afternoon, so I wanted to smile and remember how much I love them. I popped over to Stuck Sketches for some layout inspiration. Sometimes a tired momma needs an adorable place to start! I built this layout on a base of Whisper cardstock. 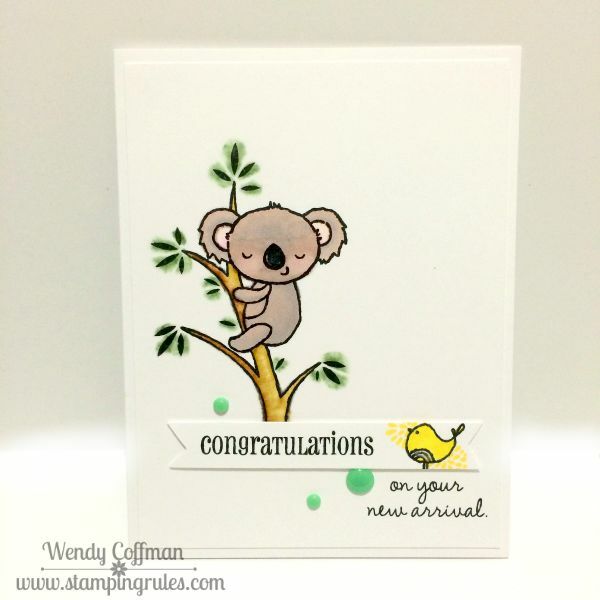 I stamped the base with the FUN sentiment from the ZOE Workshop on the Go Kit using Slate ink. 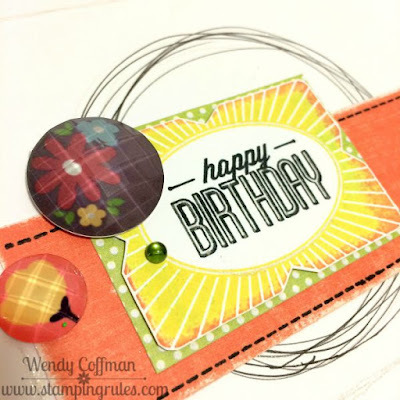 Then I layered on Zoe papers mixed with some bits of Blossom papers. I'm gonna miss those Blossom papers when they retire in four more days. 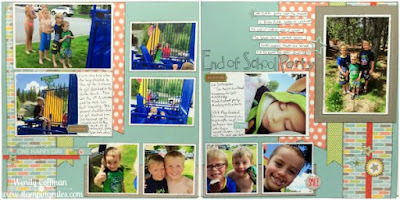 I trimmed out a piece of a Babycakes Picture My Life Card for the upper left corner of the page. I hand sketched this circle accent, and hand trimmed the green dot Zoe arrows for the journaling. I got the vellum sunshine from the Zoe Complements, and the LIFE button from the Zoe assortment. 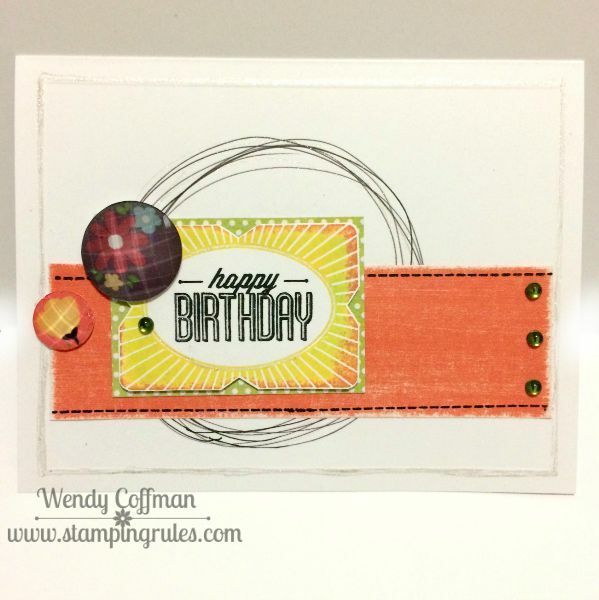 The lower circle element is stamped from Doodled Designs. I added that awesome sticker from my leftover Wildwood My Crush assortment. I stamped the title pieces with the Zoe WOTG stamp set, and that's also where that sweet arrow stamp came from, too. 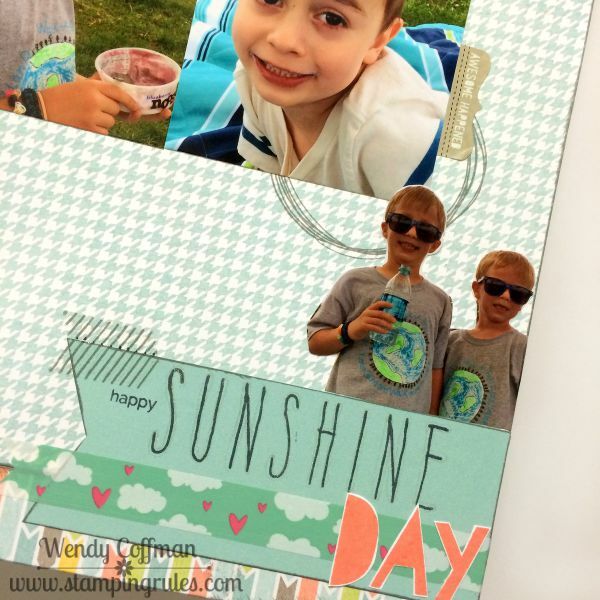 I'm linking this layout up to the Heart 2 Heart Good Day Sunshine Challenge. Scrapbooking is my therapy - I feel a lot better now. Tomorrow is another (sunshine) day! Tonight I was playing with the new Mojo Monday Sketch. I wanted to use my favorite Doodled Designs, but the circle was a bit too small, so I doodled my own bigger circle using a skinny black marker and my shimmer gel pen. I sanded some Sorbet cardstock for the band, and added black stamped stitches using the Zoe WOTG stamp set. I added a framed sentiment using the August SOTM. Then I topped the card off with some Zoe Assortment buttons and green epoxy dots. Fast, fun, and done! See ya tomorrow! I was showing Sarah how to cut an oval out of the front of this THANKS SO MUCH card from the Artfully Sent Cricut cartridge using Design Space. As you can see, I couldn't toss it. I trimmed it down to fit a 4x4 card, and, using the new sketch from Retrosketches, I whipped up a cute little card in minutes. I carefully sanded the cricut cut cardstock with my emery board so I wouldn't mess up the adorable attached sentiment. 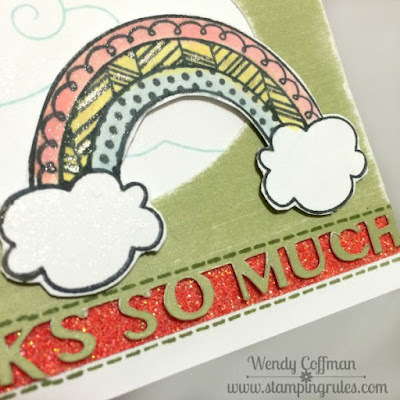 Then I stamped the sun and clouds using Rain Or Shine. I coated the sun image with Wink of Stella. Then I added the stitch detail using the stitch stamp from the Zoe WOTG. That is one of those stamp images bound to get it's own block and a place of honor on my stamp table. It's small enough to be easily included in my basic on the go kit too! Hooray for stitching with no stitching! That heart is hand-cut from a scrap of coral shimmer trim. I ran a strip of the coral shimmer trim behind the sentiment along the bottom of the card. 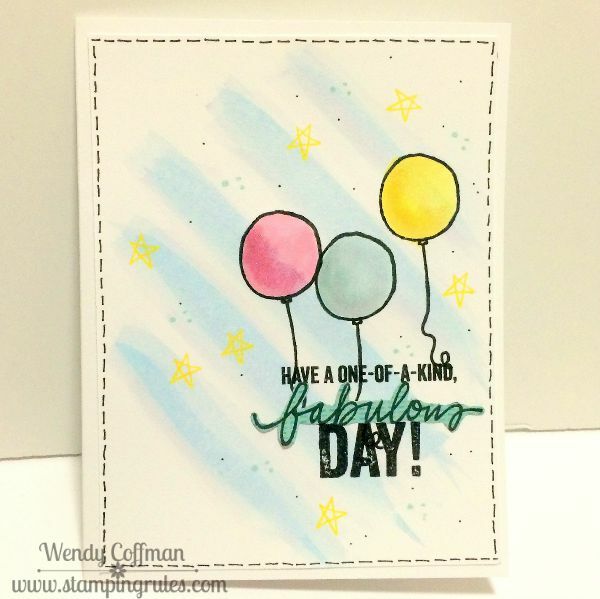 I stamped the rainbow from Rain or Shine in Memento Tuxedo Black, then colored it in with a waterbrush and 3 inks: Sorbet, Canary, and Glacier. That got a nice coating of Wink of Stella too. Thanks for the crafting time, and the inspiration, Sarah! It's Monday, which means it's time for another Atlantic Hearts Sketch Challenge! 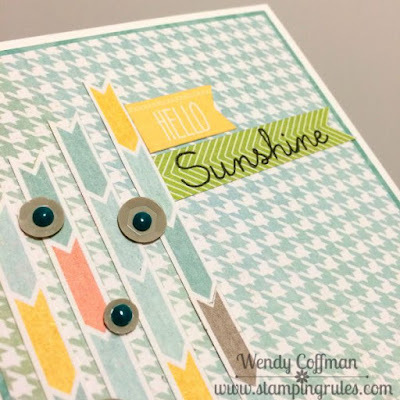 I had this teensy Hello sticker banner leftover from my Zoe Scrapbook kit pages. So I stamped a Sunshine tag using a bit of the printed zip strip. I love that every page comes with a 1/2" bonus print/element! I hand trimmed some strips from the Zoe Arrow print paper. Then I added some grey sequins topped with Aqua Dots. I hope you'll hop over to Atlantic Hearts and give this week's sketch a whirl! It's here! 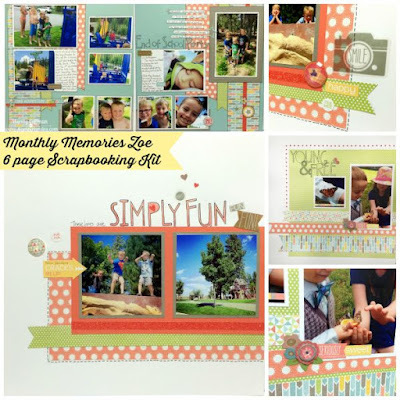 the Monthly Memories Zoe kit is finally here. These are the six pages we are making for Zoe, Scrappin' Friends. Please excuse the crooked photography - I swear in real life everything lines up just right. This is my first kit with the new Complements, which are now an awesome mix of cardstock weight stickers. 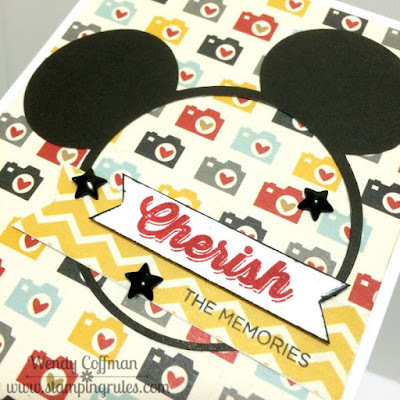 vellum, and chipboard embellishments all in one handy package! We are doing some fun techniques with the Hopscotch Alphabet for the titles this month. It's my favorite alphabet...for now! The colors in Zoe are bright, cheerful, and perfect for a wide variety of pictures. 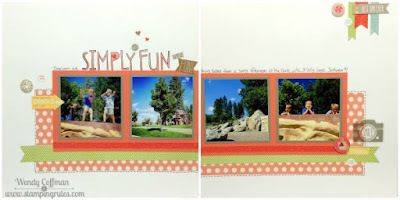 How fun is this reverse frame technique using the Coral Shimmer trim? It adds just the right touch of sparkle! Ready to get your kit? Hop over to my shopping website and order your preferred kit materials. 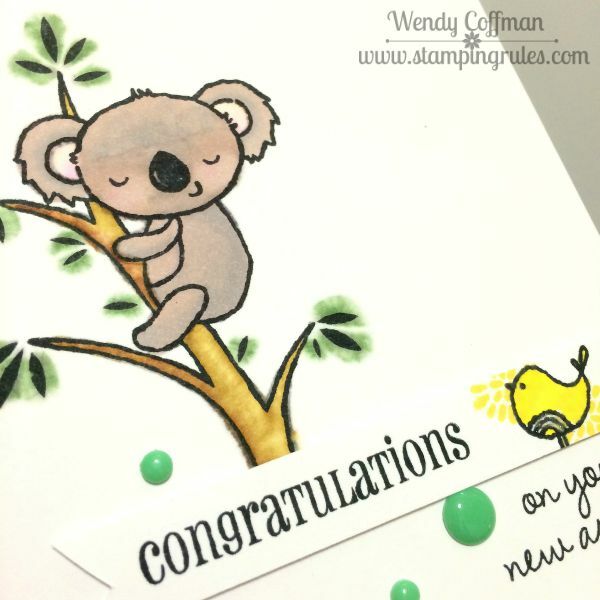 Your full color guide complete with cutting guides, close up pictures, and step by step instructions will arrive in your inbox within 24 hours of your kit order. You can create most of what you see here with the Basic Kit, or you can get the affordable I Want It All kit to get all the goodies. 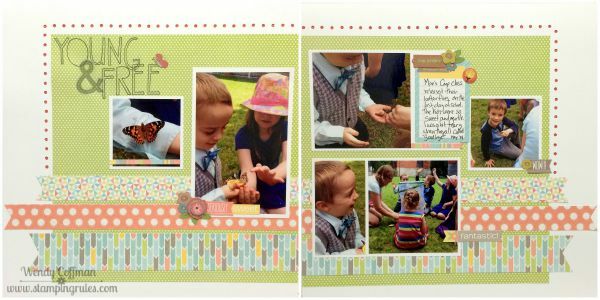 Both kit levels will require two additional sheets of White Cardstock to create all 6 pages as shown. If you have any questions, just let me know! Isn't this just the most adorable paper? I could have made so many more pages as the colors and the sweet new Complements are just simply fun, fun, fun! 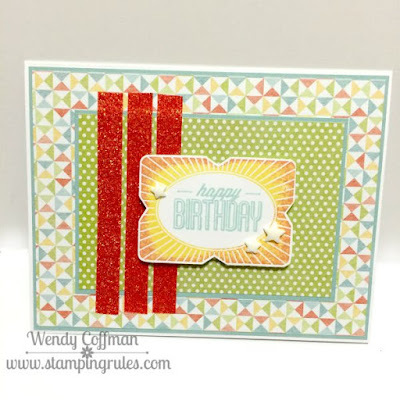 I hope you love the fabulous mix of chipboard, sticker, and vellum in the new style of Complements as much as I do. I'll share all six pages tomorrow once I finish up the instructions for y'all. Scrappy hugs! Tonight I decided to do another take on the current Cardabilities sketch. I already made this card using the sketch, but Then I saw this color challenge from ColourQ, and I wanted to pull out more of the gray color. 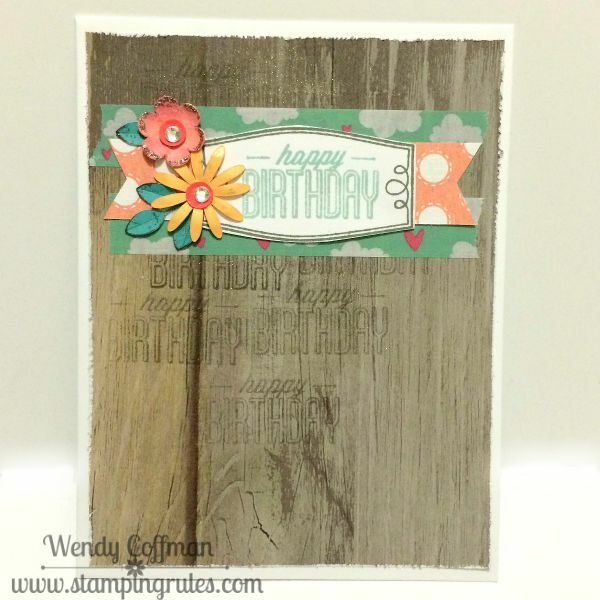 So I chose some grey woodgrain for the card background. I stamped it with Slate ink and the HAPPY BIRTHDAY sentiment from the August SOTM. Then I swooped some clear Wink of Stella over the background for a subtle shimmer. I laid down my current fav cloudy heart washi tape and topped it with a Sorbet Zoe polka dot banner. I added a Slate frame with a Glacier sentiment in the center and a few cricut cut flowers I found hanging out in my scrap bin. Serendipity! Tonight I'm sharing the last card from my Zoe kit this month. It's a simple but sweet Birthday card. I just love the colors in this Zoe paper packet. 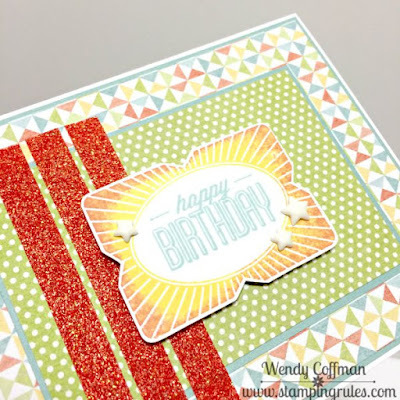 I added some strips of Coral shimmer trim to bring some sparkle to the design. I inked the sunburst frame form August SOTM in Canary ink, then rolled the edges in Sorbet ink before stamping onto white cardstock. 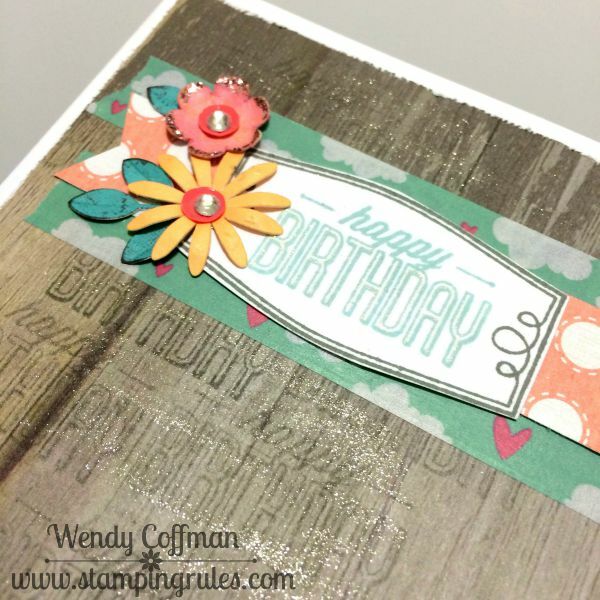 Then I added the birthday sentiment in the center with Glacier ink, A few epoxy stars finished off the design. Tonight I wanted to do something for the Freshly Made #200 sketch challenge. The sketch is so open ended that I literally stared blankly into space for quite some time. Finally I decided I had to use what was already on my desk and just start! I stamped the top of my white cs panel with the THANKS sentiment from the August SOTM in Glacier Ink. Then I added a panel of the green dot pattern from Zoe. I crossed that with a strip of my new Love My Tapes cloud washi. Sometimes you start out with an idea, and then as you are working the art just takes a turn on you. That happened to me tonight, though I hope you are as pleased with the result as I was. I wanted to make a card for the MUSE card challenge. I tried a few card bases, embossing and masking to no avail. 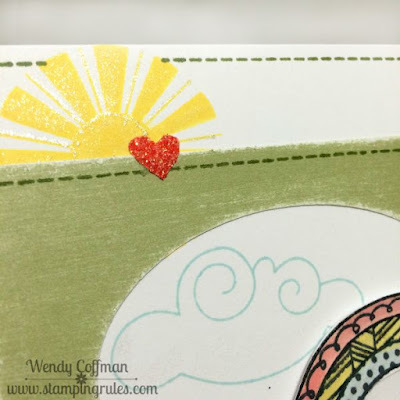 Then I had the bright idea to paint my ink directly onto this quatrefoil embossing folder. I was using watered down Lagoon ink, and it just kept beading up on the folder. So I decided to go with it and embossed the inked folder anyways. I kind of liked the scattered lagoon droplets look, so I watered my ink down even more and washed some light lagoon color over the dotted embossed surface. I embossed an Artiste Butterfly diecut with gold embossing powder. Then I dipped the edges of the wings back into Versamark ink and embossed them again with some Zing! Gold Glitter finish embossing powder. Finally I colored a Heidi Swapp watercolor words piece I just picked up last weekend with a Wink of Stella in Glitter Black brush pen. I dabbed on some gold stickles and topped my butterfly with a couple Bitty Sparkles to finish up my card. This wasn't where I meant to go when I set out this evening...but sometimes you end up just where you need to be. Au revoir, Stampin' Friends! When the new Mojo Monday sketch hit my inbox this morning I knew I wanted to make a card with it. After spending the morning at the pool stitching on a layout, the afternoon was spent playing games with the boys, doing laundry, and making strawberry jam. This evening I finally found a moment to make this sketch into a card. I sanded a Glacier CS card front. Then I added a few strips of the cloud heart Washi Tape I got from Love My Tapes. 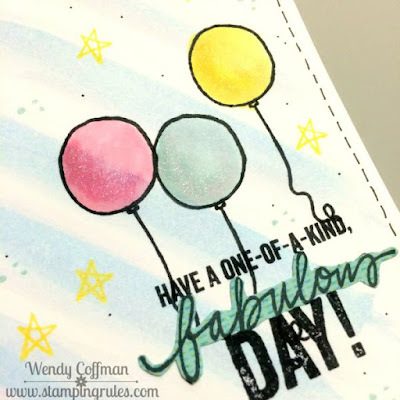 I layered on a few bits of Zoe paper, and outlined everything with a shimmer gel pen. The sentiment and the flower images are from Lovely Birthday. I stamped the flowers in Sorbet ink and then washed them with ink using my waterbrush. I layered some sequins and sparkles onto the fussy cut flowers to finish off this sweet, lovely card. Today I got my order from Love My Tapes, and I couldn't wait to bust into the rolls of goodness. I based my card on the new sketch from Cardabilities. 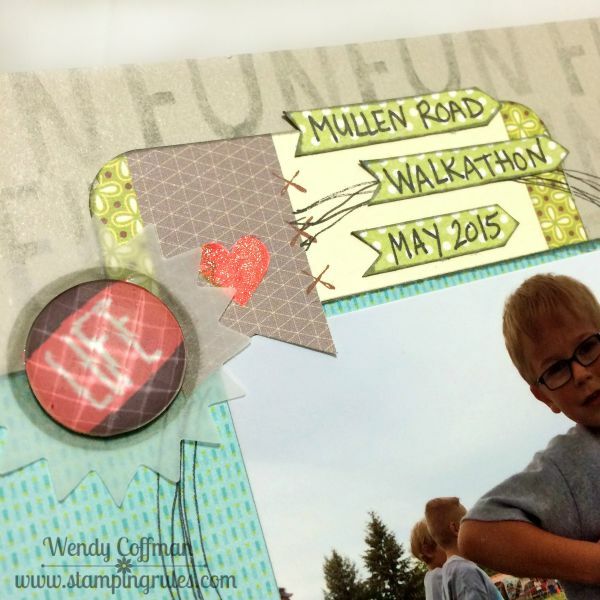 Instead of the banner I added a swath of this adorable heart cloud washi tape. I think it's gonna be a favorite, so cheerful and bright! 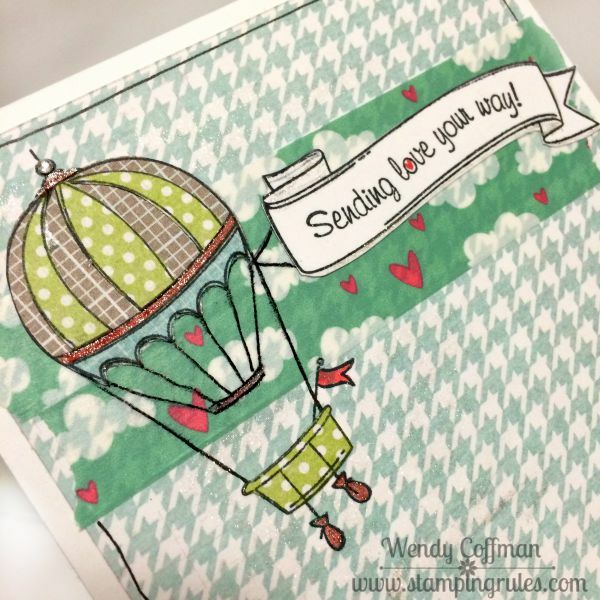 Then I paper pieced the balloon from Lifting Spirits using Zoe papers. I'm so bummed that Lifting Spirits is retiring at the end of this month, I need to get a few more projects in with this set! I added some sparkly accents with a shimmer gel pen and a red Wink of Stella marker. Quick and simple so I can tuck it into the mail for a special friend tomorrow!